A prophetic memoir by the activist who “articulated the intellectual foundations” (The New Yorker) of the civil rights and women’s rights movements. Poet, memoirist, labor organizer, and Episcopal priest, Pauli Murray (1910-1985) helped transform the law of the land. Arrested in 1940 for sitting in the whites-only section of a Virginia bus, Murray propelled that life-defining event into a Howard law degree and a fight against “Jane Crow” sexism. Her legal brilliance was pivotal to the overturning of Plessy v. Ferguson, the success of Brown v. Board of Education, and the Supreme Court’s recognition that the equal protection clause applies to women; it also connected her with such progressive leaders as Eleanor Roosevelt, Thurgood Marshall, Betty Friedan, and Ruth Bader Ginsberg. Now Murray is finally getting long-deserved recognition: the first African American woman to receive a doctorate of law at Yale, her name graces one of the university’s new colleges. Handsomely republished with a new introduction by Patricia Bell-Scott (an award-winning biographer and presenter), Murray’s remarkable memoir takes its rightful place among the great civil rights autobiographies of the twentieth century. 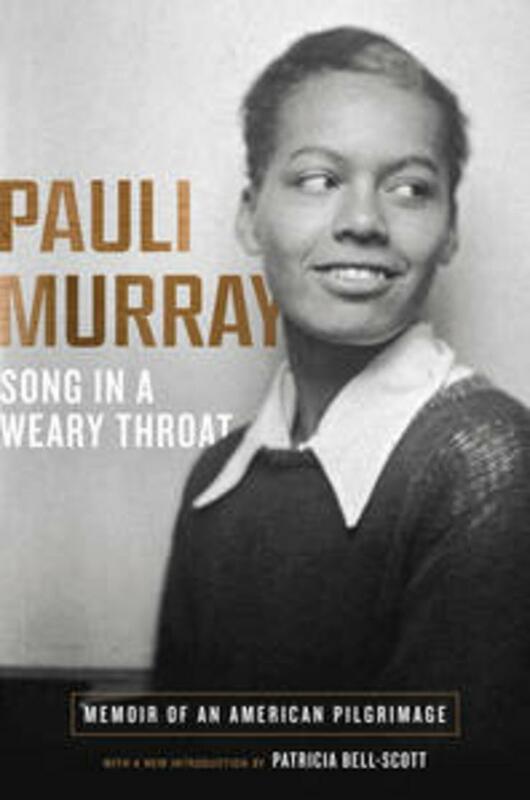 Pauli Murray (1910–1985) was born in Baltimore and raised in Durham, North Carolina. The first African American woman to receive a doctorate of law at Yale, her name now graces one of Yale University’s new colleges. She is the author of Song in a Weary Throat, her posthumous memoir. Patricia Bell-Scott is an award-winning author and professor emerita of women’s studies and human development and family science at the University of Georgia. Her most recent book, The Firebrand and the First Lady: Portrait of a Friendship: Pauli Murray, Eleanor Roosevelt, and the Struggle for Social Justice won the Lillian Smith Book Award and was named Booklist Best Adult Nonfiction Book of the Year by the American Library Association. This book was also named a finalist for the Andrew Carnegie Medal for Excellence in Nonfiction, and longlisted for the National Book Award. Her previous books include Life Notes: Personal Writings by Contemporary Black Women, which was a featured selection of The Quality Paperback Book Club; Flat-footed Truths: Telling Black Women’s Lives; Double Stitch: Black Women Write about Mothers and Daughters, which won the Letitia Woods Brown Memorial Book Prize, and All the Women Are White, All the Blacks Are Men, But Some of Us Are Brave: Black Women’s Studies, an award-winning textbook. Bell-Scott served for a decade as co-founding editor of SAGE: A Scholarly Journal on Black Women. She is a former contributing editor to Ms. Magazine. She is also a cofounder of the National Women’s Studies Association. A native of Chattanooga, Tennessee, Bell-Scott lives in Athens, Georgia with her husband, Charles Vernon Underwood Jr.